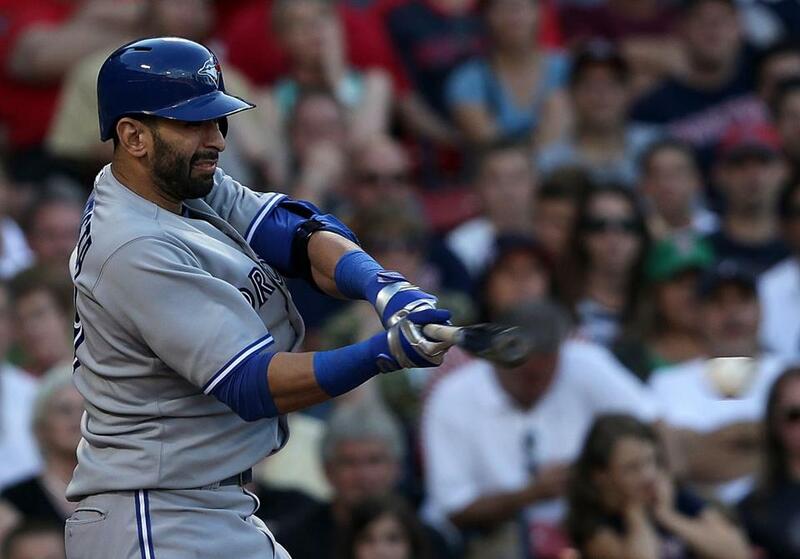 Toronto slugger Jose Bautista had his stroke down, homering twice and driving in three. Red Sox third base coach Brian Butterfield considers Toronto right fielder Jose Bautista one of his all-time favorite players to coach. And it’s no wonder. When he’s on, Bautista is one of the best all-around players in baseball. He hasn’t always been on this year, but Saturday afternoon, Bautista did it all. Butterfield’s decision to send Shane Victorino home to try to score on Dustin Pedroia’s single to right in the sixth inning — with no outs, the heart of the order coming up, and the Sox trailing, 2-0 — was curious because Butterfield knows Bautista has one of the game’s more accurate arms. But Butterfield, one of the game’s more astute coaches, noticed Bautista fielded the ball leaning toward his right. He figured it would be a tough transfer of his body into the proper throwing position. And with the speedy Victorino running, why not give it a try? Why not make Bautista make a perfect throw? Well, he did. Catcher J.P. Arencibia also made a perfect block and held on to the ball after a collision with Victorino. A run was prevented. A big run. Especially since the Sox could have had runners at first and third, nobody out, with David Ortiz and Mike Napoli coming up. It had the potential for a big inning against Blue Jays starter Esmil Rogers. But this play stopped any momentum in its tracks. When you’re in first place, and when your entire M.O. is to be aggressive, why not? You’re losing by two runs after taking the first two games of the series. So why can’t you be aggressive here? I have no problems with Butterfield’s decision. Bautista just had one of those days. Two home runs, including his 200th, throwing a runner out at the plate, and also good base running with a stolen base. “You try to get through the year without too many of those,” said Butterfield, a coach with the Blue Jays until coming to Boston with manager John Farrell. “You’d like to have that one back. The fewer of those, the better. It’s the nature of the beast. I’d like to have that one back. There were no outs and we were in the position of the lineup where it was in our favor. What about Victorino running? Did that affect the decision? Bautista’s perspective was also interesting. Bautista has 18 homers and 48 RBIs, but he’s hitting only .248. He’s had good production but still hasn’t locked in at the plate, where he’s become a 40-home run candidate in any given season. He had also thrown out a runner in the Jays’ previous series in Tampa Bay. He appears to be back on a roll at the plate and showing off his arm. “It’s more difficult and more rare to throw people out on the bases, so when I do that I enjoy it a lot more than two home runs,” Bautista said. Bautista, who wore R.A. Dickey’s pants and went back to two-tone bats to change his luck, said he had good batting practice Saturday and started to feel the timing mechanism in his swing returning. His 200th homer over everything in left was retrieved for him by a parking lot attendant across the street where the ball landed. Butterfield also had another play he answered for — a safety squeeze in the seventh inning — with Jarrod Saltalamacchia on third and newly elevated Jonathan Diaz bunting. Saltalamacchia was thrown out by Toronto reliever Darren Oliver with another nice tag and block by Arencibia. Why attempt that with a slow runner like Salty? “Great play by Ollie [Oliver],” Butterfield said. “Ollie is older than I am so you don’t expect him to make that play but it was a great play. Not a bad bunt by Johnny. Salty and I just spoke about it, the break that he got. In that situation when you try the safety squeeze, it opens up a lot of things because they try to get too aggressive with a play at the plate and all of sudden you have multiple runners on base, but it didn’t work out today. “I’ll take that one [the loss],” said Butterfield. And Bautista, showing his old coach why he always believed in him, will take it, too.